Celtic star Paul Lambert will take over as Livingston boss on 1 June following the announcement that current manager Richard Gough would be leaving the job. It was revealed on Tuesday that Gough, 43, would be standing down after Saturday's Scottish Premier League relegation decider with Dundee. He wants to return to the United States to be with his family. Midfielder Lambert, 35, will leave title-chasing Celtic after almost eight years at the club. Celtic boss Martin O'Neill has backed Lambert to be a hit at Livingston. O'Neill told Celtic's website: "I honestly believe that this is a terrific chance for Paul and that's regardless of whether Livingston manage to stay in the SPL, although obviously it would be preferable if they can. "People will say that he's very young but I for one think that he's well up for this job and well capable of doing it extremely well. "He has great experience in the game, and while none of that is in management, Paul Lambert has all the qualities and characteristics to become an excellent manager." Former St Mirren captain Norrie McWhirter will be Lambert's assistant at Livingston. 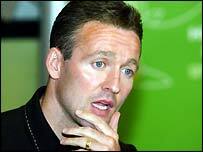 Lambert, who was a Champions League winner with Borussia Dortmund in 1997, had made no secret that he was keen to move into coaching or management. He had been linked with Clyde, Ross County and Inverness over the past year. In 2004, Celtic agreed that he could spend two four-week periods in Germany for a coaching course with the German Football Association. Both Lambert and McWhirter, who is a qualified coach, have agreed three-year deals. Livingston chairman Pearse Flynn said: "We are delighted to confirm Paul Lambert's appointment as manager in time to plan ahead for next season and to take charge of all football matters at Livingston. "The club finally came out of administration last week and we have a vital match against Dundee on Saturday. "After that we will be able to plan properly for next season and it was important that we completed the new appointment to enable that." Gough's assistant Archie Knox will also be leaving the club after the weekend but Alec Cleland and Graeme Robertson are to remain as reserve-team coach and youth development manager.